The reactions to Will Smith as a blue genie have us GASPING | SHEmazing! A few months ago, Will Smith appeared on the cover of Entertainment Weekly alongside the stars of Disney's live-action remake of Aladdin, and people had something to SAY. Basically, he wasn't blue, and this deeply offended the general public. Like, DEEPLY offended. Scuba diving in the Pacific deep. He took to Instagram to defend himself, writing; "I’m gonna be BLUE! This is how the Genie is in human or disguise form. My character will be CGI most of the movie." Our first look at Will Smith’s Genie in the live-action #Aladdin has appeared and he’s not CGI! Thoughts? However, during the Grammy's ad-break last night, a new trailer for the movie was released and once again, fans ain't happy. Disney managed to sneak in a minute-long trailer featuring Naomi Scott as Jasmine and Mena Massoud in the protagonist role. 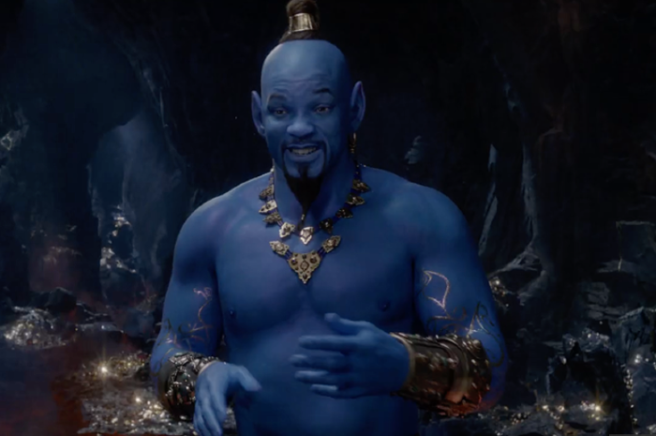 Will Smith's turn as the Genie has EVERYONE talking. The 50-year-old actor is under a lot of pressure, taking over the reboot role from Robin Williams' iconic performance. Sharing his own reaction to the trailer release, Will wrote on Instagram: "I told y’all I was gon’ be Blue!! Y’all need to trust me more often!" When he accepted the role, the actor said: "Whenever you’re doing things that are iconic, it’s always terrifying. The question is always: Where was there meat left on the bone? Robin didn’t leave a lot of meat on the bone with the character." The 1992 animation starred Robin Williams, and became especially iconic for his role in the voice acting and music. The memes have already begun flowing in, and we are entertained to say the least. wonder if the new aladdin is gonna be good..
Do you think he deserves all this slagging? We don't think so, but by GOD are we enjoying the memes. Keep 'em coming, people. Aladdin is set for release on 24 May, so we'll see what the reaction is to the full flick in due course.